It's the season of baseball for me this time of year. trade this time with him for the world. I created this card with his coach in mind. He eats, drinks and sleeps baseball and is so deserving of a thank you card for all of the time and dedication he puts into his team. life lessons, and for that I am grateful. I actually used a Great Impressions Stamps border stamp for this card. Using sections of the border I created my background paper. get the darker and lighter effect. Those are nestabilitie squares for the bases and I added a triangle to make home plate. The colors I choose are my son's team colors. This border stamp is so versatile. It's also great for scrapbook pages and bordering a sports photo. I may use it next for a collage of all the boys. Quite the excitement going on at the Great Impressions Stamps Blog! first offering a badge for our top picks! So clever! 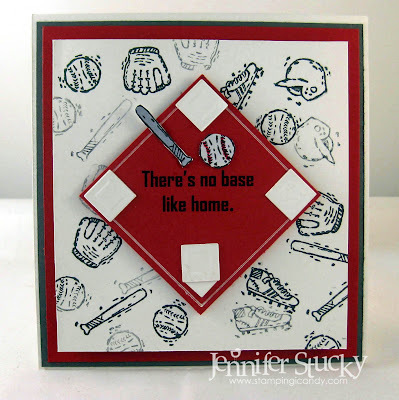 Love the sentiment and baseball diamond layout. Awesome job! I like how you used the border stamp diagonally to make a background! Very clever! Sometimes we forget how versatile our stamps can be! Thanks for the ideas! Neat card! Love the fun baseball diamond and the clever background! 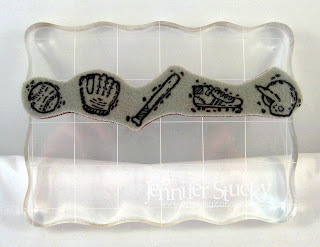 This card is definitely a home run Jenny!! !